Bring an exotic paradise into your home with this exciting coconut syrup. Experience the truly tropical taste of coconut in this delicious product. Banish those gloomy days by brightening up your beverage with this delightful and uplifting flavour. This product compliments so many other syrups so experiment with all kinds of flavour combinations. This pure, sweet and distinctive syrup is the perfect addition to so many drink recipes. Use this versatile product to add a wonderful refreshing element. Where Can I Buy Coconut Syrup? Buy this syrup with confidence from Adams and Russell as this product will deliver excellent flavour every time. DaVinci are dedicated to only using the highest quality ingredients in their products, such as pure can sugar, so this syrup will not let you down. They are also specially formulated to resist curdling with dairy products, as this is a problem faced with some other sweeteners on the market. The plastic user-friendly bottle means you can be re-assured that no dangerous situations will arise when using this product in a busy environment. This is great if you have children in the house or if used in a coffee shop. 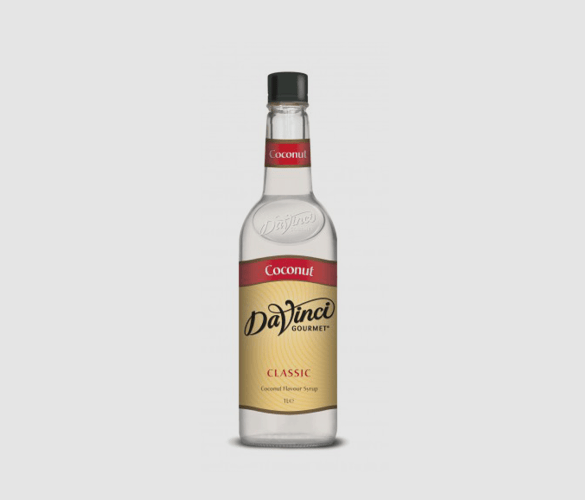 How Can I Use This DaVinci Coconut Syrup? There are so many ways you can put this coconut syrup to good use in the kitchen. Some classic flavours that will always pair well with coconut are chocolate, vanilla, fruit and nut. Coffee – Coconut lattes and cappuccinos are delicious, and a must try. Tea – Skip the boring one teaspoon of sugar and try a splash of coconut delight. Cookies and Brownies – Stir some into your dough to add a subtle hint of refreshing coconut. Salad Dressing – Homemade dressings are the best when it comes to salads. Next time your making yours try adding a little bit of syrup to sweeten things up. It works fantastically with the savoury flavours. Ice-Cream – DIY ice cream is fun and delicious, and this coconut flavour is an easy way to give an exotic taste. This truffle recipe from Try The World are indulgent, luxurious and incredibly moreish. In a saucepan on a low hear, stir together the cream and syrup. Cut the vanilla bean in half lengthwise and scrape out the seeds. Add the pod and seeds to the saucepan and bring the mixture to a simmer. Continually whisk and do not allow to boil. Once the mixture comes to a simmer, remove the vanilla bean and pour into the bowl of chocolate. Stir until smooth and then mix in the butter. Cover the bowl and refrigerate for at least 4 hours or until hardened. To form the truffles, roll about 2 teaspoons of the mixture into a ball and then roll into the cocoa powder. To finish, sprinkle with a little sea salt and dig in!